During the last couple of days I started experimenting a little bit with XMPP (again) and also installed my own little ejabberd server. Right when I was finished with that, another project by ProcessOne popped up on my radar: Tweet.IM. 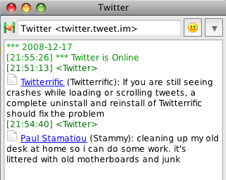 Remember when Twitter still had that nice XMPP-gateway where you could post using your Jabber client? Yeah, that one … a long time ago. Since November there is with Tweet.IM an alternative for that non-existant service which actually works pretty well. You can post messages, send direct messages (although to all the people I want to talk to in private, I’d simply use their IM-account, to be honest) and receive the latest posts in an interval of, I guess, 5 minutes. So far I’ve noticed just one problem with it: If you’re using Adium, the IM client tries a little bit too hard to interpret some of the data tweet.im sends it. The gateway sends some avatar information as XHTML-IM, to show you also the avatar of the user you received a tweet from. Adium doesn’t really support XHTML-IM to that extent and shows you a broken image with each update. Not a big problem, but it becomes really annoying when it forwards that data to Growl ;-) There is currently a discussion going on about this, so if you have this problem on the support forums. So, I guess, the more people thinking it’s worth changing, the more likely something will change there. But otherwise, big thanks to ProcessOne for this service.